Pharmaceutics is the discipline of pharmacy that deals with the process of turning a new chemical entity (NCE) or old drugs into a medication to be used safely and effectively by patients. It is also called the science of dosage form design. There are many chemicals with pharmacological properties, but need special measures to help them achieve therapeutically relevant amounts at their sites of action. The Department of Pharmaceutics and Pharmaceutical Technology has state-of-the-art facilities which are as per the evolving needs of the pharmacy profession i.e. the pharmaceutical and health care industry. The department is involved in teaching and training in all areas of pharmaceutics and pharmaceutical technology, with emphasis on the major interrelated areas. The department deals with the theoretical as well as practical knowledge of the following modules of courses that a student needs to acquire: Pharmaceutics, Physical Pharmacy and Pharmaceutical Dispensing. The department curriculum consists of courses involving both basic and advanced pharmaceutical sciences. The department also provides to the need of the students for newer subjects like Bio-pharmaceutics where the basic concepts of ADME and fundamentals of bioavailability and bioequivalence are taught to the students. Students are also trained on the basic concepts associated with the novel dosage form at the undergraduate level, which is the need of the Pharma industry. The department also has aseptic laboratory with unique instruments like Laminar air flow unit, membrane filtration assembly, BOD incubator, autoclave, hot air oven, centrifuge, electrophoresis unit etc. to name a few. The students acquire skills from the basic principles of pharmaceutics up to gaining knowledge on novel drug delivery systems. 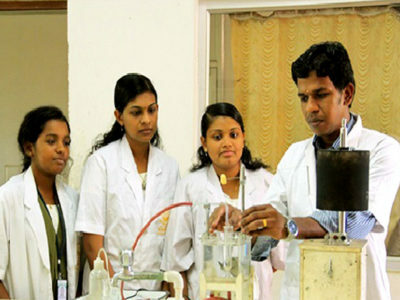 The department has well designed and equipped laboratories with various sophisticated machinery required for imparting knowledge to the students regarding various formulations, processing and testing equipment used in the manufacturing of pharmaceutical dosage forms like tablets, capsules, liquids, semi-solids, parenterals and novel drug delivery systems. The Department of Pharmaceutics is a place where continual commitment to excellence in research, instruction and service is demonstrated through the extraordinary productivity and success of our faculty, staff and students. We offer a training environment that includes laboratory instrumentation and technologies, award-winning faculty, devoted and experienced teachers, and knowledgeable staff.